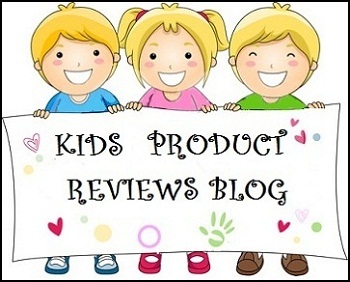 This is a review of Aloe Veda Moisturising Bathing Bar Jojoba Oil with Green Tea Extracts. 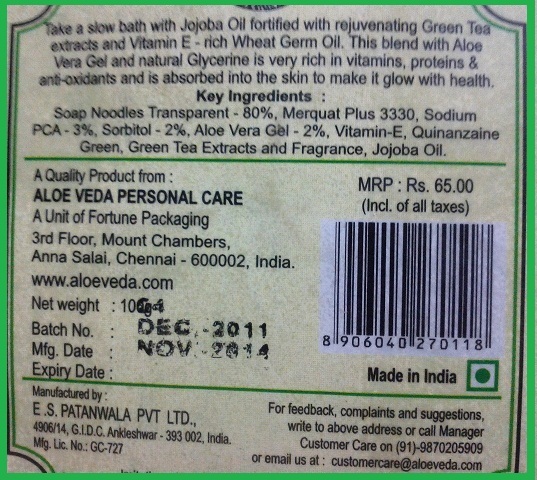 When I upgraded from ordinary bath soaps to hand-made soaps, Aloe Veda was the first brand I had tried. 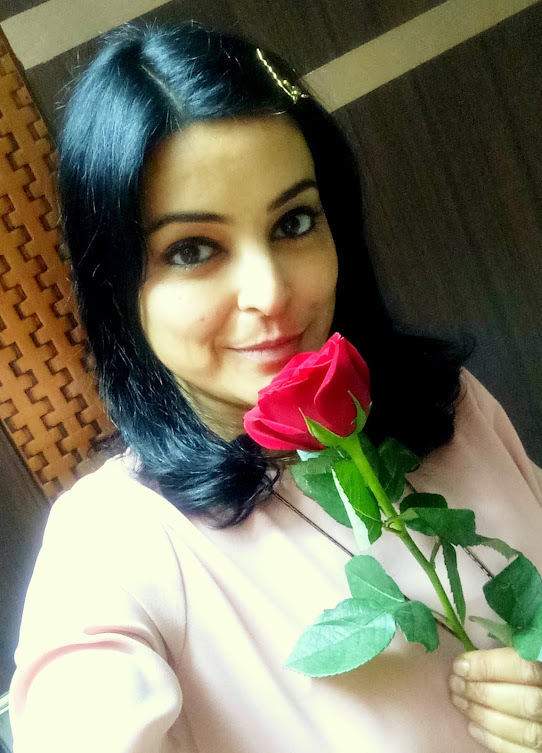 At that time medplusbeauty.com was offering a promotional discount of 25% on all Alove Veda products. I tried many soaps from this range and repurchased a few. Available only on online stores. 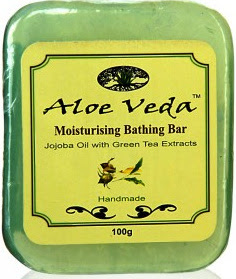 WHAT ALOE VEDA CLAIMS ABOUT JOJOBA OIL WITH GREEN TEA EXTRACTS SOAP? Take a slow bath with Jojoba Oil fortified with rejuvenating Green Tea extracts and Vitamin E - rich Wheat Germ Oil. This blend with Aloe Vera Gel and natural Glycerine is very rich in vitamins, proteins and anti-oxidants and is absorbed into the skin to make it glow with health. Ingredients: Soap Noodles, Merquat Plus 3330, Sodium PCA, Sorbitol, Aloe Vera Gel, Vitamin E, Quinanzaine Green, Green Tea Extracts and Fragrance, Jojoba Oil. Green Tea: Anti-bacterial and an anti-oxidant, which keeps skin healthy. Jojoba Oil: Provides hydration and moisturization to the skin. Aloe Vera: Is highly known for its skin benefits. Merquat Plus: Helps the soap produce rich and thick foam. Gives a silky velvety feel to the skin. Reduces the stretched dry feeling you get with normal soaps. Sodium PCA: A natural ingredient that helps in binding moisture to the skin cells, leaving the skin highly moisturized after bath. Sorbitol: Provides transparency to the soap. Also acts as a humectant (helps retain moisture in the skin cells) like sodium PCA. Quinanzaine Green: This is probably the soap's green color. I couldn’t find any information on this ingredient. This soap is quite moisturizing and leaves the skin squeaky clean. Ideal to be used in humid weather. Quite good for people with oily skin. May be a little dry for people with dry skin, if used in winters. The fragrance stays on the body for hours after bath, so you don’t need to use a separate perfume. The soap smells like Tea tree oil but the fragrance is a little on the higher side, which I didn't like. For me, bathing should be a spa like experience to calm your senses and not to overwhelm them. The synthetic perfume made me giddy if I happened to bring the soap near my nose, though thankfully, the fragrance left behind on the body after bath was milder. I have not repurchased this soap because of too much perfume. Same problem as with all their soaps - Poor and difficult to remove packing. Plus this particular soap bar was a little beaten on the edges (thanks to poor storage condition of the online store). I have noticed the soaps I had bought in last winter were hardened just because of poor packing. Available on the Aloe Veda Online store, urbantouch.com, goodlife.com, medplusbeauty.com (at 25% introductory discount), helathkart.com, flipkart.com etc.